SARANDE, Albania (CNN) -- Albanian unrest spread to the southern town of Sarande, where rioters torched buildings and looted shops without interference from police, the state news agency said Sunday. 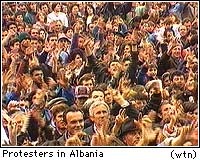 Parliament voted to declare an immediate state of emergency throughout Albania in response to the riots rocking the nation, the speaker of the chamber announced. A crowd of 1,000 anti-government demonstrators sacked the Sarande police headquarters, taking weapons and releasing prisoners held in the building's jail, witnesses said. No injuries were reported, hospital officials said, "because their were no clashes. The police have fled." Heavy black smoke billowed from the police building, a bank and a library in the town Sunday morning, and gunshots continued to ring out. "It all started yesterday after (President Sali) Berisha said the government was to resign," said a resident who gave his name as Markos. "The demonstrator first stormed the police headquarters and took weapons and started shooting in the air ... then they went on to break into shops and state banks." Berisha announced Saturday that he had accepted the resignation of right-wing Prime Minister Aleksander Meksi. But he said Meksi will remain as a caretaker "until a new prime minister is named following consultations with other political parties." "The people want (Berisha's party) to resign from all power," said Democratic Alliance party leader Neritan Ceka. "It is responsible for the chaos in Albania." Chaos and unrest have been the rule in Albania since the collapse of dubious "get-rich-quick" pyramid schemes in January left thousands in the already-impoverished country broke and destitute. Berisha blames Albania's troubles on left-wing instigators and denies claims that his government profited from the failed investment schemes. Both opposition leaders in Tirana and those leading the protests in southern Albania said they are still demanding Berisha's resignation and the establishment of a "technical government" consisting of "neutral" intellectuals and non-politicians until national elections can be held. The protesters in Vlora issued an ultimatum to Berisha on Sunday, calling on him not to stand for re-election Monday and to dissolve parliament. Protest organizers of local opposition parties said if Berisha did not respond by Sunday evening, Vlora residents and supporters in the region would move on Tirana, 150 km (90 miles) to the north. Reporters in Vlora Sunday morning said there was still no sign of any police or security presence in the town. Groups of armed people were patrolling the town and firing shots into the air but there had been no further rioting overnight. Berisha's villa in Vlora was among the buildings sacked by the protesters, however. Witnesses said looters carried away doors and windows, and uprooted flowers from the villa's gardens. A speaker at a daily rally in the town said that protesters were holding secret police agents hostage, and called the president "a terrorist." Rioters in the coastal town of Himara and the town of Fier also reportedly burned police buildings overnight.